Thanks to our excellence at meeting customer needs, we have positioned ourselves as a prime Manufacturer, Exporter & Supplier in the industry. 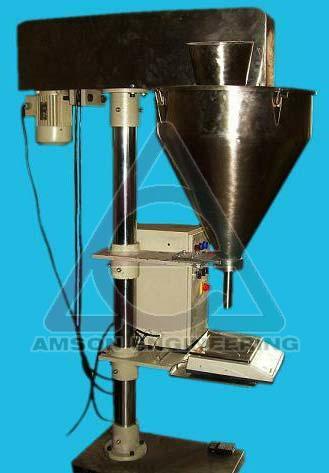 We offer Weighmetric Powder Filling Machine in a wide range of designs and specifications to choose from. Our outstanding quality team runs various quality tests to make sure we exceed the quality standards. These quality checks make certain its durability, fine finish and impeccable quality. Powder filler is made strong and vibration free by its specially designed Pillar structure. This is made from Mild steel ROUND Pipe section of good thickness Hard chrome Plated, which holds drive unit, hopper and related parts. A drive motor and an electromagnetic clutch brake assembly are driving the Augur. A safety cover is provided to this assembly to protect from accidents and to avoid dust from drive. Main driven shaft connected to the drive shaft through a Bearing housing holds and rotates freely when the machine is operated. A stirrer blade provided separately which is operated independently over the driven shaft. The driven shaft is holding an accurately machined stainless steel AUGUR which performs the filling inside the Nozzle. The lower parallel flights of the auger within the funnel are machined to a constant pitch so that, when filled, each pitch has a precise volume. The auger drive rotates the auger at constant speed to produce a continuous dosing flow. The agitation blade, generally separately driven and controlled, rotates in the opposite direction to the auger breaking any bridge that tends to form in non-free flowing powders. The agitation blade extends right down to the throat of the funnel preventing rat-holing and cavitation and ensuring that the flights are fully filled. The start/stop signals to the auger drive control the pre-set weight in Weigh metric fillers. Machine size - 1000 L X 700W X 2100mm height. Weigh balance - Maximum load capacity - 3 Kgs. Augur Based filling equipped with digital Weigh balance (load cell). Drive through electro-magnetic clutch brake system to get high accuracy filling. High output and increased efficiency. Output of 15 fills/minute can be achieved. High Accuracy up-to +/- 0.5% of fill volume. Low maintenance needed in this model.